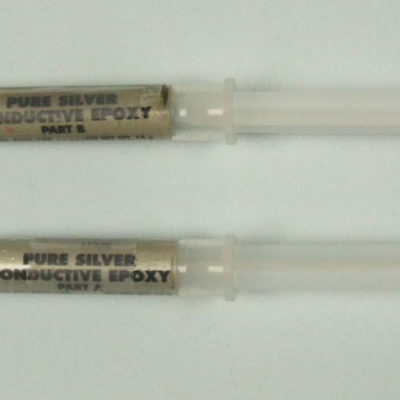 A silver conductive paint you can paint straight on without having to apply a key layer. It is specially developed for using with an airbrush. 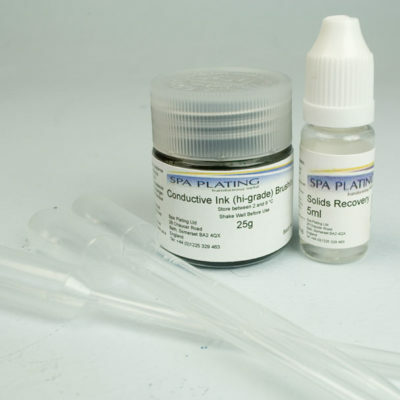 This conductive paint airbrush version is best suited for tank electroforming. This item cannot be purchased and shipped outside the UK and the EU because it’s part of our range of items which are regulated for transport. Our Conductive Ink (hi-grade) may be a suitable substitute and the link to this product can be found in the ‘Related Products’ below. 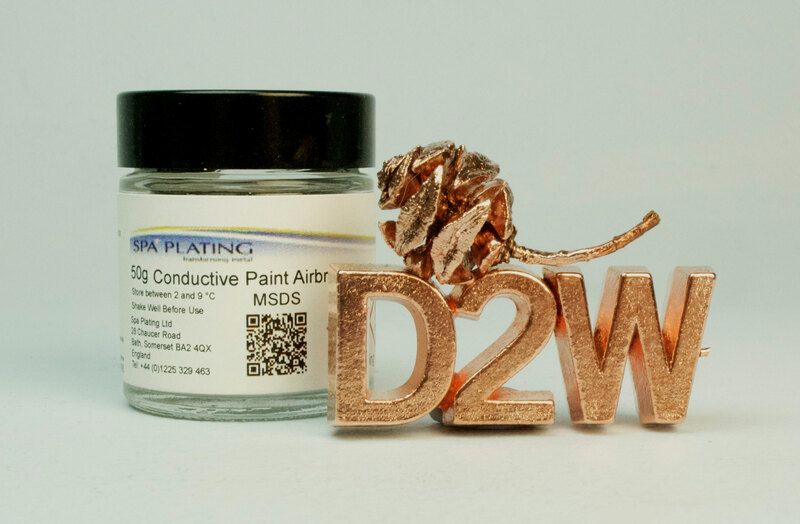 Our Conductive Paint is ideal for selective electroforming, as you don’t have to apply a previous key layer of either lacquer or Glass Primer. This means no need for tricky masking out jobs as you can apply the Conductive Paint just in the places you want the electroforming to take place. 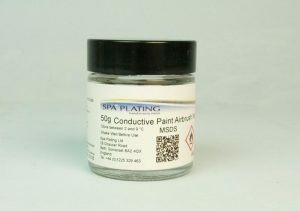 Conductive Paint is an easily applied paint which produces conductive films on non-conductive surfaces. 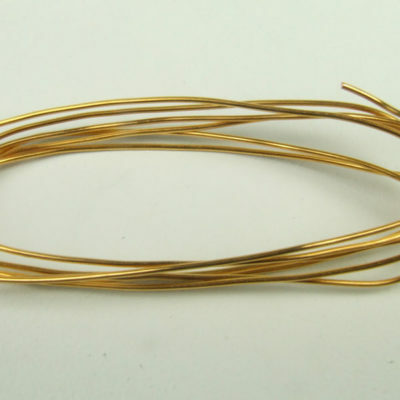 Low temperature curing permits use on temperature sensitive and other delicate materials, i.e. paper, plastics, wax mandrels, natural products such as flowers, leaves, etc. A suspension of finely divided silver in a thermoplastic vehicle. It must be thoroughly mixed before use, and shaken or stirred regularly during use to avoid settlement of the silver powder. Conductive Paint can be applied by hand brushing, or by dipping or spraying. For spraying, thinning to a suitable viscosity is usually necessary, using Thinners for Conductive Paint. 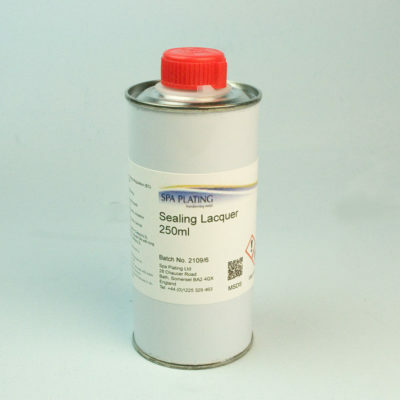 This solvent can also be used to clean brushes and equipment. Cellulose thinners can also be used for cleaning brushes and equipment, but is not recommended for dilution of the paint. Observe appropriate precautions for handling flammable liquids. It will dry very quickly in air but to ensure complete removal of solvent before plating, it is advisable to dry for 30 minutes at 60 – 80°C or 60 minutes at ambient temperature (20 – 25°C). 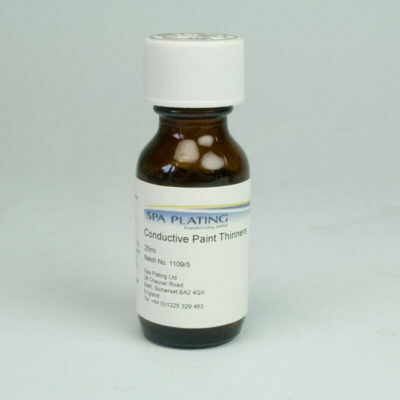 It is possible to apply several coats to a figure or mandrel to produce a thicker, more conductive silver layer before electroplating. On wax or silicone rubber moulds, ensure the contact wires are firmly held in place, and the Conductive Paint is also applied to the contact wires for continuity of circuit. Thorough curing between applications is essential to minimise running. Wax moulds should be washed carefully in dilute neutral detergent and dried thoroughly before applying Conductive Paint, to remove debris and oily patches. This project shows you how to copper electroform on stone using a slice of agate as an example. This is demonstrated using our Conductive Paint, which can be used for electroforming on a wide range of non-conductive surfaces. 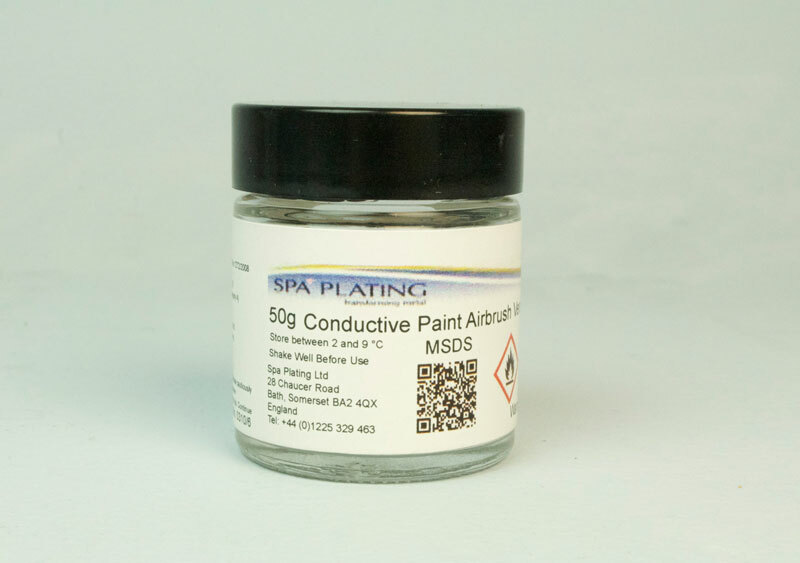 Our Conductive Paint can be purchased through our Special Orders shop and can only be shipped in the UK and the EU. depending on the material you’re electroforming onto, the Conductive Paint can be applied without having to first spray on a key layer of lacquer. This is great if you’re intending to selectively electroplate, as you don’t have to do any tricky masking out. The second factor that makes it a quicker option is that it becomes touch dry in 4-6 minutes and fully cured by 1hr at 60 degrees centigrade. This considerable advantage needs to be weighed against certain other factors. In this project we’ll be showing you how to prepare a slice of agate for electroforming. 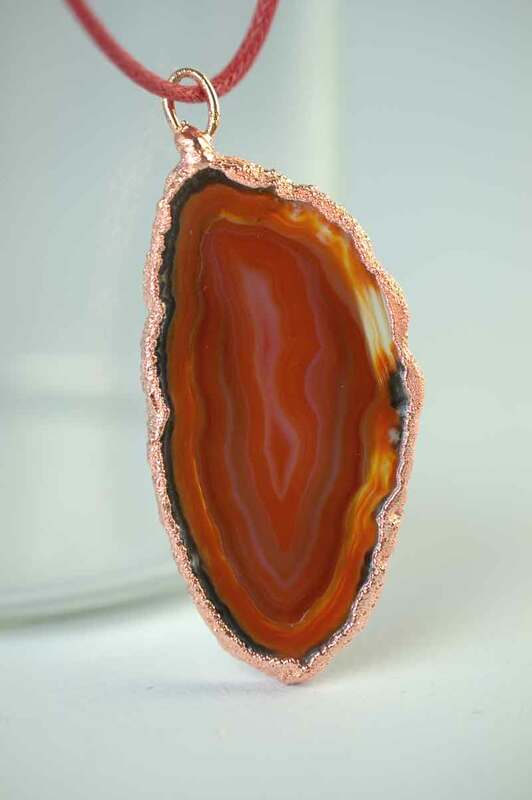 Agate is predominantly made of silica and therefore won’t be attacked by the Copper Electroforming Solution. However, if you were intending to selectively electroform a shell, you would have to cover the entire surface in lacquer before you applied the Conductive Paint. This is because shells are made of calcium carbonate which would be attacked by the Copper Electroforming Solution. Conductive Paint can only be painted on and if you were planning on electroforming a very smooth surface, the brush marks may show up. In this case, you would need to use our Conductive Ink (hi-grade). Also, the Conductive Paint takes longer to build a shiny layer of copper. Get together everything you need for preparing the agate slice; this will include the Conductive Paint, The tubes of Conductive Epoxy and a jump ring to hang the agate piece on the chain, once it is electroformed. At this stage you need to work out the surface area of part of the item you’re intending to electroform. The rim of this slice of agate was 3.5 cm squared and this was noted for later use. 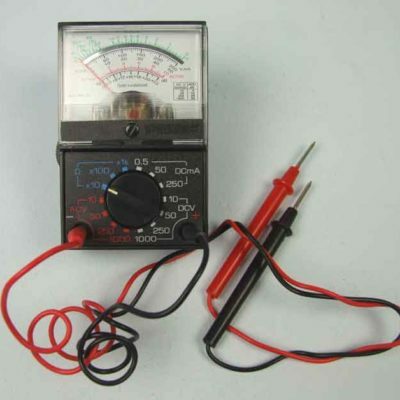 It will also be useful to have your Conductivity Tester to hand, to check that the Conductive Paint and the Conductive Epoxy Filler you’ll be applying is, in actual fact, conductive. 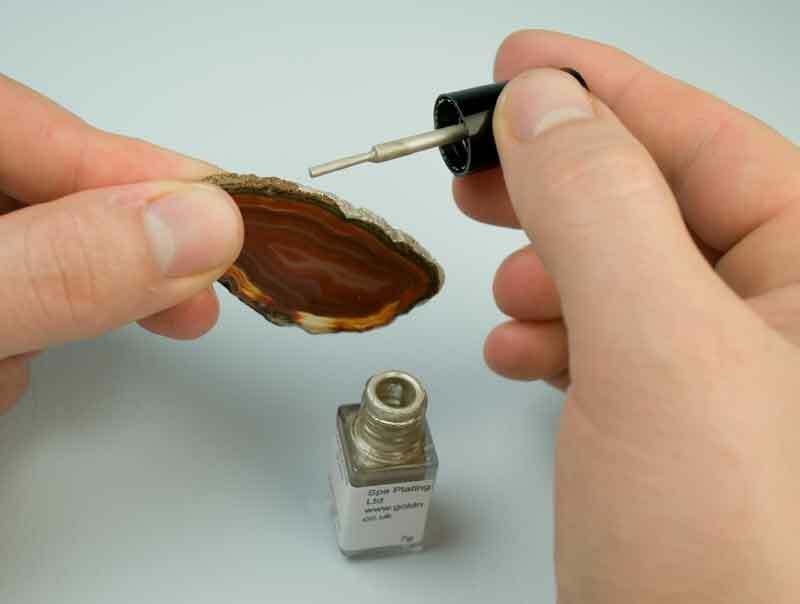 Carefully paint on the Conductive Paint around the rim of the agate slice, using the enclosed brush. Once this is done, either leave to dry at room temperature (25 degrees centigrade) for 24 hours or dry in a fan oven at 60 degrees centigrade for an hour. To attach the jump ring to the rim of the agate slice, mix up a small amount of our Conductive Epoxy Filler and use this to stick the ring directly onto the dried Conductive Paint. 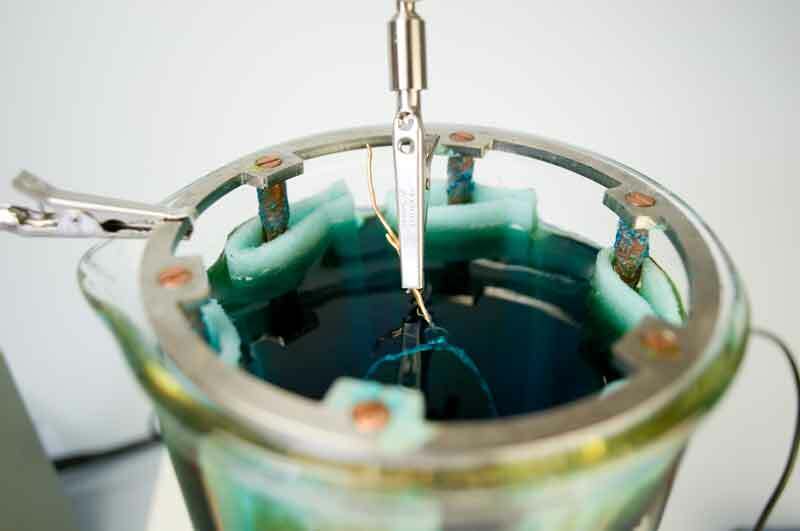 The ring now performs two functions; it allows the piece of agate to be hung from its chain and it also forms the conductive connection that the agate can be held by in the electroforming solution. The surface area of the rim of this slice of agate is approximately 3.5 cm squared and the required thickness of the electroforming is 100 microns. 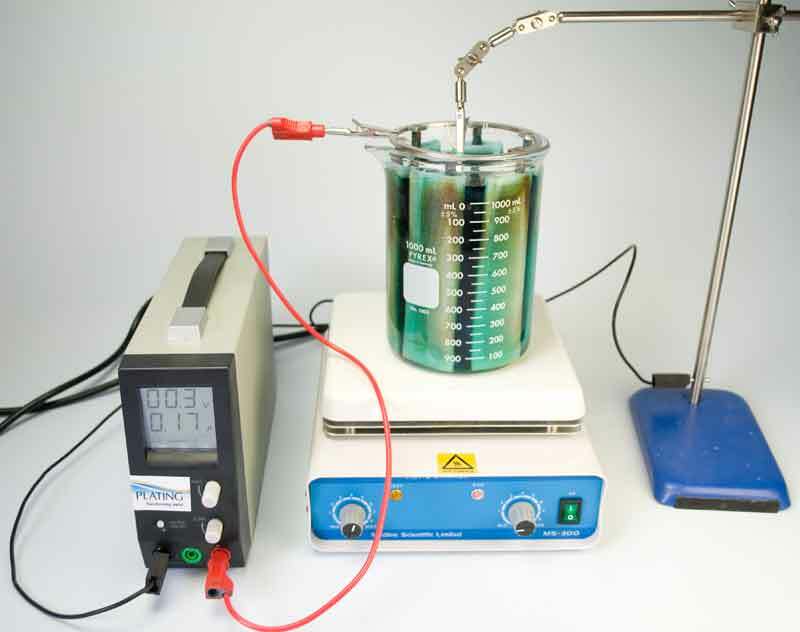 These details are entered in to our online Electroforming Calculator and this produces an amp level of 0.175 and a plating time of 1.30 hours. The finished piece of electroformed agate was taken out at the end of the alloted time and given a rinse. It is now possible to apply other plated layers of silver or gold, for example using either tank or brush plating or a combination of both. Touch dry time @ 25 °C 15 minutes brush, 1 – 2 minutes airbrush. A nominal value of 1 ohm per square, where the actual value depends on film thickness and uniformity.